The brown bear (Ursus arctos) is a large bear distributed across much of northern Eurasia and North America. Adult bears generally weigh between 100 and 635 kg (220 and 1,400 lb). Its largest subspecies, the Kodiak bear, rivals the polar bear as the largest member of the bear family and as the largest land-based predator. There are several recognized subspecies within the brown bear species. 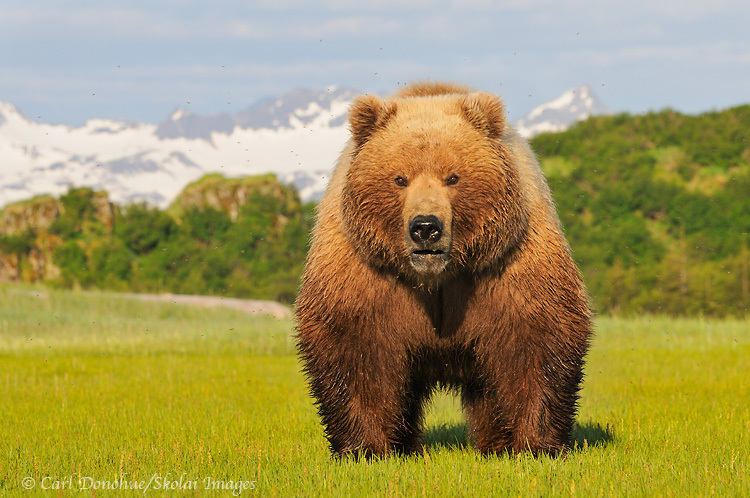 In North America, two types of the subspecies Ursus arctos horribilis are generally recognized—the coastal brown bear and the inland grizzly bear; these two types broadly define the range of sizes of all brown bear subspecies. An adult grizzly living inland in Yukon may weigh as little as 80 kg (180 lb), while an adult coastal brown bear in nearby coastal Alaska living on a steady, nutritious diet of spawning salmon may weigh as much as 680 kg (1,500 lb). The exact number of overall brown subspecies remains in debate.